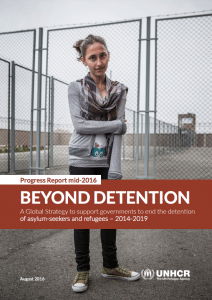 The Strategy is a five-year initiative (June 2014 – June 2019), through which UNHCR is working with governments and other relevant stakeholders to address some of the main challenges and concerns around detention policies and practices. For its initial two year implementation phase, the Global Strategy is being rolled out in 12 focus countries, selected on the basis of a range of criteria, including regional and thematic diversity, size and significance of the problem, likelihood of making an impact in the initial roll-out period (albeit without prejudicing long-term impacts), as well as staffing and resources. The 12 focus countries are: Canada, Hungary, Indonesia, Israel, Lithuania, Malaysia, Malta, Mexico, Thailand, the United Kingdom, the United States and Zambia.